Many are familiar with the Schwartz circle of basic values. The closer the values are in this circle the more compatible these values are for pursuing the same goals. But it is a common misconception that this “compatibility” implies positive correlations. 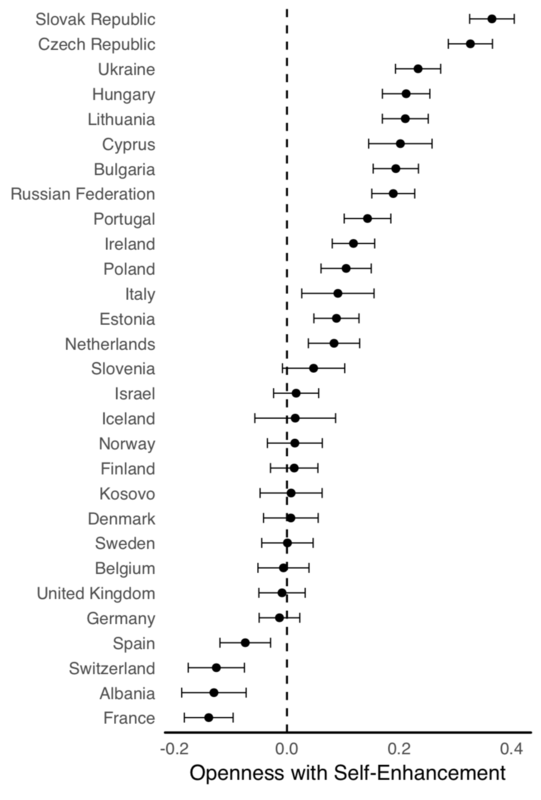 In our paper, we aimed to describe the actual correlations between higher-order values across hundred countries and about half a million respondents. You can see that the correlations differ a lot across European countries, moreover, they switch signs, being negative in France and very positive in Slovak Republic. At the next step we questioned – are these differences in correlations systematic? We found that these correlations depend on economic development of the country (but not on income inequality, slightly – on education level). We claim that economic development, or wealth, provides resources for people to develop more complex value systems in which values are less dependent on immediate profit. This paper may explain all kinds of cross-level interactions. For example, the weaker link between conservation values and xenophobia in less developed countries might be explained by its connection to self-transcendence which doesn’t exist in more developed countries.